Preparing for an OSHA VisitFrank H. Furman, Inc.
Use the guidelines below to help prepare for an OSHA inspection. What comprises an OSHA inspection? What should I do if OSHA wants to inspect my worksite? Ask for the purpose of the inspection. Has there been a complaint? OSHA can inspect a workplace if it has probable administrative cause for the inspection. Employers have the right to request an inspection warrant or negotiate for a limited scope for the inspection in exchange for their consent to an inspection without a warrant. Provide a room with privacy for the inspector. 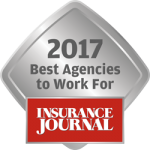 Determine how you will handle the inspection. Let the inspector in to proceed with the inspection, accompanied by appropriate personnel. Inform appropriate production personnel (managers, supervisors) of the imminent inspection; advise them to quickly tour their areas and make “last minute” improvements (e.g., housekeeping, PPE). Someone who is familiar with your written programs and your facility should accompany the inspector at all times to ensure questions can be answered appropriately. If the inspector identifies any “quick fix” items, have them taken care of immediately, or at least by the time the inspector returns again. Take “before” and “after” photographs of every improvement made. If the inspector takes photographs or video, consider doing the same concurrently. If the inspector conducts noise or air monitoring, consider doing the same concurrently. Take detailed notes during the post-inspection conference; the inspector’s comments are likely to be items that might show up in citations. 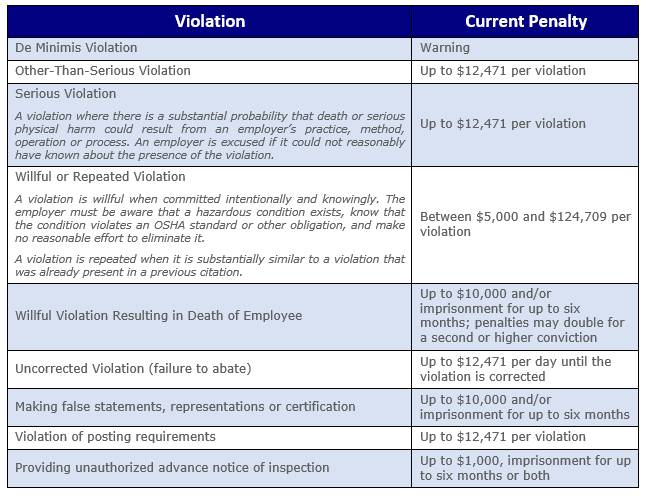 What are OSHA’s violation classifications? 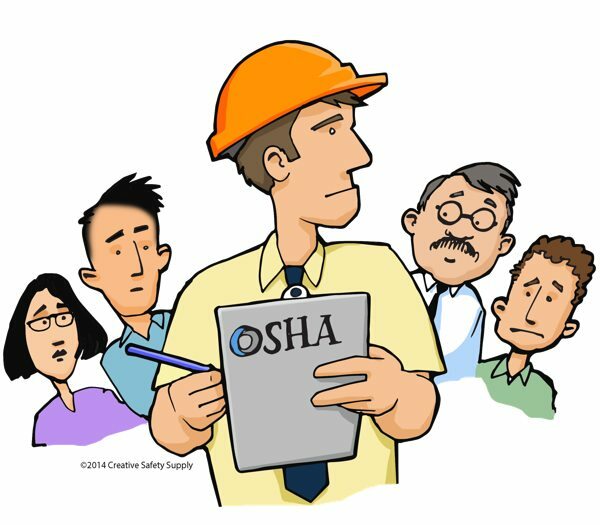 Why might OSHA write a citation and assign a $0.00 penalty? OSHA often assigns a $0.00 penalty in order to write a large number of citations without it being unrealistically expensive for you. However, this is typically only done once; if OSHA finds the same violations in the future; it may cite you for a “willful” or “repeated” violation and assign a penalty up to $124,709. Be sure to start with a clean slate. All violations from previous inspections should be cleared, or you may be assigned large penalties. What should I do if I receive citations following an OSHA inspection? OSHA may offer a reduction in the penalty if it feels the inspection otherwise went well; it will ask you to agree to pay the penalty early in order to pay the discounted amount. If you strongly disagree with one or more citations, send OSHA a letter of “Notice of Contest” within 15 working days of the inspection; a verbal statement expressing your desire to contest a citation is not enough. The Notice of Contest must clearly identify the basis for filing the citation, the notice of proposed penalty, the abatement period or notification of failure to correct violations. The Occupational Safety and Health Review Commission (OSHRC) will assign your notice to an administrative law judge. Legally invalid notices will be dismissed. Valid notices will be scheduled for a hearing. You will have the right to participate in the hearing. You can appeal the administrative judge’s decision to the OSHRC. An OSHRC ruling can be appealed to the appropriate federal court of appeals.